It was cold this morning so rather than cycling from the park and ride into College I took the bus and with little to look at, as the windows were steamed up, I browsed the BBC news on my phone. Quite a long way down the news list and not a main article was; "Hubble achieves deepest view yet". 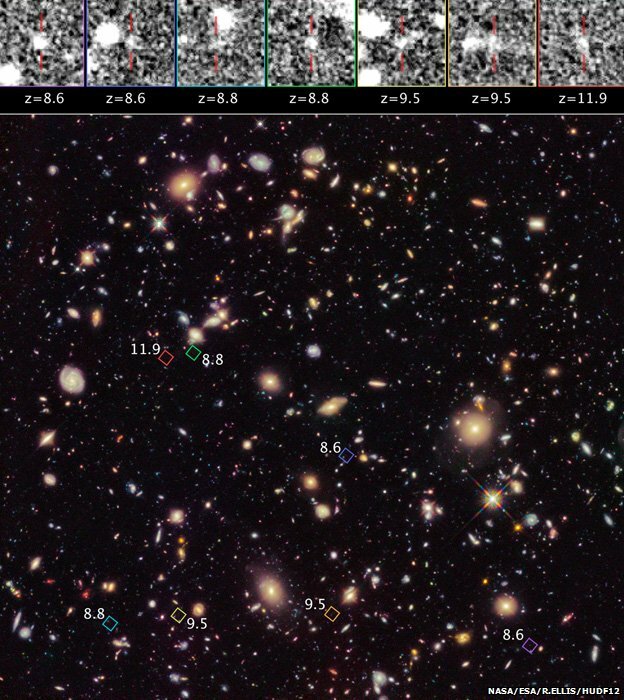 The first line of the article: "Hubble astronomers have observed deeper into space than ever before" caught my attention. As someone both interested in science and in our cosmic history I read on. "The new results stem from a project called UDF12 and centre on a tiny patch of sky in the Constellation Fornax (The Furnace). This is the location where Hubble has repeatedly stared since 2003, trying to build up a picture of objects whose separation from us is so great that their light arrives in dribs and drabs". Now this is the BBC and they are trying to make science accessible, but I was struck by the use of the term "dribs and drabs", I continued to read the article. "The objects lie in a range that covers redshifts 8.2-11.9 - the technical way of describing a period in time that runs from about 600 million years to 380 million years after the Big Bang (current cosmology suggests that a Big Bang occurred some 13.77 billion years ago)". 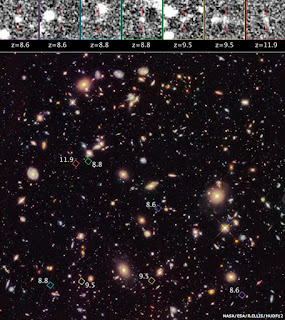 "These images are giving us the tantalizing view of what happened in the very earliest stages of the Universe. This is the time when the Universe was filled with hydrogen and starts to make stars and galaxies that make the chemical elements that we are primarily made out of - the oxygen we breathe, the iron in our blood, the calcium in our bones." Buried in the text of the article was one sentence which was probably the most important and really quite under-played. The sentence was this: "The data supports the notion that the first galaxies assembled their constituent stars in a smooth fashion - not in some sudden burst". Congratulations to Richard Ellis from the California Institute of Technology (Caltech) and colleagues at Edinburgh University, including Jim Dunlop and Ross McLure - you have just illuminated another part of the story of our universe.